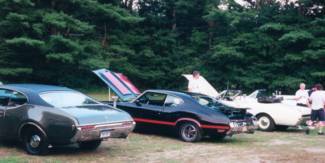 On August 18, 2001, the Pleasant Valley Drive-In hosted a car show and showed the classic films American Graffiti and Vanishing Point as the feature night of Oldies Weekend. The drive-in is the perfect location for an oldies weekend, as many elements of normal drive-in operation inspire nostalgia in visitors. In fact, little has changed at the drive-in since it opened. 1942 army surplus projectors serve up movies the old-fashioned way; projectionist Don Schaefer loads the first reel on the first projector, the second reel on the second projector, starts the first reel and watches for the circles in the upper right hand corner which cue him to start the second reel. Once the second reel rolls, he can rewind and remove the first reel and then load the third reel on the first projector. Modern movie theaters often use a single reel/single projector system. 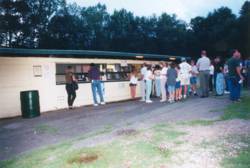 Owners Donna and Tim McGrane of Winsted like the nostalgic experience the drive-in offers its customers, who come from all over Connecticut, Massachusetts, and New York. Donna's parents, Marquis and Paul Haynes worked at the drive-in back in the late 1960s and early 1970s when Donna was growing up just a half-mile down the road and she treasured her times there. When the drive-in went up for sale in 1985, she knew she had to buy it. The couple, who also own McGrane's Restaurant in Winsted, have split their time so that Tim primarily oversees the restaurant while Donna handles the theater. Their three children love to come along to the drive-in on weekends. The drive-in originally opened in 1947 and was known for years as the Rodgers Corners Drive-In. The McGranes aren't the only ones with a family tradition here; projectionist Don Schaefer's aunt and uncle, Dorothy and Frank Cappabianca are previous owners of the theatre. Although Frank has passed on, Dorothy still resides in Riverton. 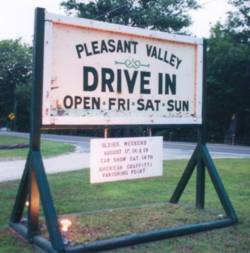 The Pleasant Valley Drive-In s old-time aura is important not only to the McGranes and their usual customers, but also to journalist Paul Lukas, who enjoyed his visit so much, he wrote an article about it for Money Magazine (August 2001 issue) called "Lost in America: The Last Picture Shows". In the article Lukas states that there are currently about 500 drive-ins in the country. The first drive-in opened in 1933 in Camden, New Jersey, and the phenomenon peaked around 1960 when there were nearly 5,000 theatres across America. Though the numbers have declined significantly, the trend leveled off in the late 1980s. A typical night at the drive-in begins early, when the gate opens at 6:30 pm. Many folks come early and get dinner from the concession stand and spend the evening outdoors. SUV rear gates are often opened up, lawn chairs often positioned outside the vehicle, children play, and adults visit with one another. On any given evening, patrons can be seen mingling and eating, playing Frisbee, flying toy planes, walking dogs, listening to music, and playing various lawn games. As twilight fades and darkness settles over town, the projectors fire up the first images and AM 530 begins the first notes of America the Beautiful. At the conclusion of that ode to our country, a nearly antique advertisement for Pic insect repellent plays before the modern movie previews. Although Pic is still sold, that advertisement has long been out of print. Each Friday, Saturday, and Sunday night, the drive-in offers its customers a double-feature of recently released films, most of which are family oriented. During intermission, the classic concession stand advertisement plays the same one featuring the dancing hotdog that was shown in the film version of Grease. On August 18, 2001, however, the McGranes tried something a bit different from the usual fare. 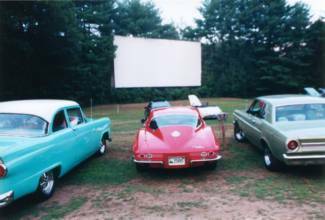 As a compliment to their nostalgic atmosphere, they served up some nostalgic films and a chance to view a wide range of classic cars. 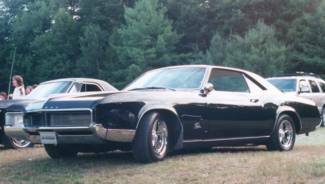 The cars ranged from 1920s to 1970s manufacture, and represented all the major American automobile makers. 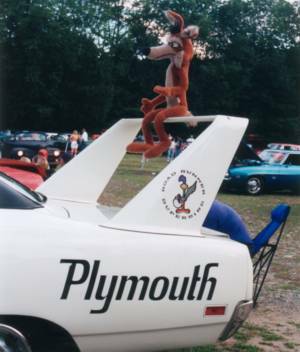 This even was arranged in conjunction with Carl Doudache of Norfolk and the Rotor Rockets Oldsmobile Club. 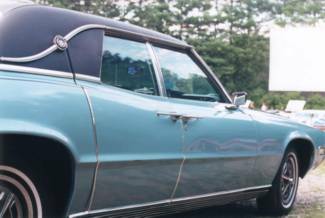 Although Donna McGrane wasn't sure what to expect for a turnout, the show was a resounding success with about 125 old cars arriving for the show and the movies. In fact, the show was so successful, the McGranes have spoken to Doudache about hosting similar shows twice a month in 2002. They also hope to hold one more show before they close for 2001 in mid-October. 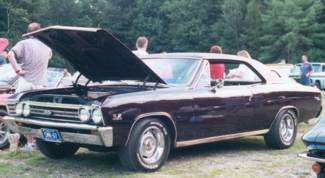 The following pictures are just a few of the many exhibitors at the August 2001 car show at the Pleasant Valley Drive-In.